GE’s Mark Wight says low-cost natural gas and new turbine technology make grid-scale energy storage uncompetitive. Widespread deployment of grid-scale energy storage is a distant possibility given the availability of low-cost natural gas, according to Mark Wight, director of strategy, marketing and operations for GE Energy Ventures. “We see [energy storage] very much on the customer side and a customer solution,” Wight said yesterday at the Global Cleantech 100 Summit in Washington, D.C.
GE’s newest H-class turbine technology can ramp up to full plant load capacity in less than 30 minutes. According to Wight, next-generation technologies will be able to ramp up even faster. GE also offers peaker units than can ramp up quickly but still remain highly efficient as they ramp down to low capacities. This allows the utility operator to maintain a spinning reserve without getting penalized for low efficiency. 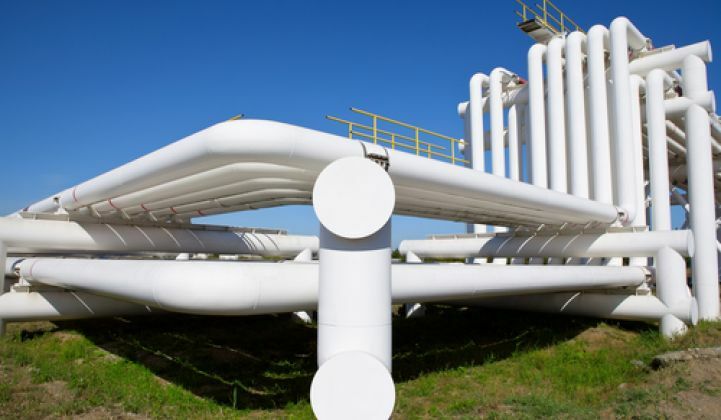 The combination of these new technology developments and low natural gas prices make gas the most cost-effective storage option in the near term, said Wight. This is particularly true in the United States, where last week the Henry Hub spot price stood at $3.89 per million Btu. Several energy storage company leaders weighed in on Wight’s comments. Phil Giudice, CEO of Ambri, a battery storage company spun out of the Massachusetts Institute of Technology, argued that storage technologies create value across many applications, including frequency regulation and spinning reserves, whereas combustion turbines require large asset investments and then sit idle for the majority of the time. Battery technologies can also scale easily, he said. Ambri will deliver its first commercial sale -- a 1-megawatt-hour battery storage solution -- to the U.S. Navy’s Joint Base Pearl Harbor-Hickam in 2016. The company’s next commercial offerings will be 2 megawatt-hours and can be added together to achieve 5-megawatt to 10-megawatt solutions. Ultimately, though, customers will decide which technology prevails. Gas today is low-cost and an improvement over old, polluting coal plants, “but I think GE’s future, if it continues to try and resist the changes…will be really tough,” Giudice said. GE has its own energy storage business, which appears to be growing, according to Ravi Manghani, senior grid analyst at GTM Research. Where the competitiveness argument is most applicable is in the domain of pure energy arbitrage applications for grid-scale storage. AES Energy Storage, for instance, is generating revenue in PJM territory with its new modular lithium-ion battery storage solution. With the advent of new technologies and economies of scale, energy storage can expect to see more widespread cost reductions. Factors such as California’s mandate for 1.32 gigawatts of energy storage by 2020, Southern California Edison’s LCR solicitation and Hawaii Electric’s RFP for up to 200 megawatts of energy storage will be drivers toward that end. GTM Research forecasts grid-scale energy storage to be economical in more U.S. states in the next three to four years. Yesterday, Cleantech Group released its Global Cleantech 100 report, which ranks early-stage companies based on their innovation and market potential. Seven energy storage companies were featured on the list: Ambri, Younicos, Aquion Energy, Imprint Energy, Ioxus, Sonnenbatterie and Stem. Sheeraz Haji, CEO of Cleantech Group, said there’s been a huge appetite in the market for energy storage for consumer applications and vehicle applications. State renewable portfolio standards and the California mandate are also pushing utilities toward grid-scale storage. “But how quickly these storage markets will develop and how well they’ll compete with other alternatives is a really interesting debate,” he said.